Administrative personnel will love our easy setup. Our automated importer will process thousands of users into your e-Portfolio with the minimum of fuss and intervention. Role-specific task management wizards and logical interfaces result in one of the least painful get-you-going implementations out there. There are no User limits imposed by the Devour Engine. “Keep It Simple Stupid!” No, it’s not rude – it’s our mantra that applies to everything that we do. We’ve rationalized, simplified and implemented an interface that not only has a pleasing (subconscious) ‘look and feel’ but also provides a pleasurable (conscious) usability. You are rarely more than 3 taps away from what you need. The analogy of ‘changing hats’ to change roles on the site uses our KISS mantra. With two taps and you are no longer a Centre Manager but an Internal Moderator with an entirely different set of permissions and abilities; you’ll see your dashboard and navigation change to reflect those changes. So whilst single role users (like a Learner) will never see any of this behind-the-scenes cleverness, your admin staff can swap hats in a blink of an eye. Create as many Roles as you need. There are no limits. The Devour Engine has access to the full range of Ofqual (21,000+) courses and you are free to add as many of these into your e-Portfolio as you like. The Devour Engine can cope with thousands of courses; work with as many as you like. MAPP’R is rather clever. It allows Assessors to view evidence online and simultaneously map it to one or many criteria, across courses if you like – all without filling your downloads folder with gigabytes of out-of-focus phone pictures. 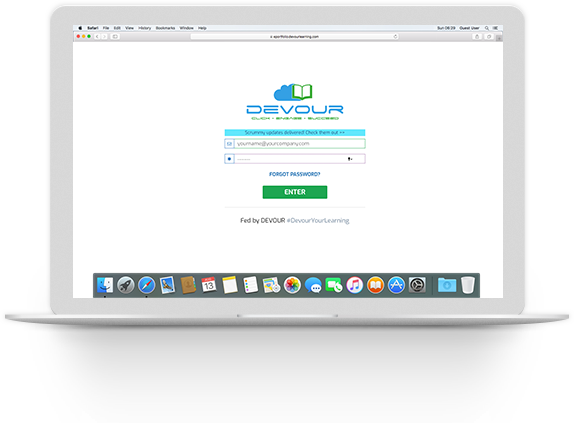 By utilising the power of the Devour Engine, notifications of feedback can be sent and received on submissions – all dutifully logged as part of a personalised Learning Plan. Video, is of course, an effective and engaging learning tool – engaged Learners are proven to have enhanced knowledge retention. We have embraced video and audio with open arms and have a fast, secure player built into our web-app. No external players, no extra software, no extra cost, no hassle. You’re welcome. Email has its place, but for those fast “can you help me with…” or “I suggest that you read up on…” to “hey there’s cakes in the kitchen!” – there are better and faster ways to work. So think of Devour’s self-hosted solution, MESSENGER, like SMS but with no additional cost. In fact, we thought it was such a good idea, we stripped it down and called this sibling QMESSAGE. A tap away on any page, it’s no-fuss, super-simple, unobtrusive popup that allows you stay on the view you are on. The inclusion of SMS was a no-brainer. You can use it as a standalone tool or allow it to trigger by key events like ‘set Task’ or ‘new Teaching & Learning’. SMS compliments all the other types of communication methods available in the site, you can rest assured that information has got through to the recipient in a secure and timely fashion. There’s no setup cost. It’s all part of the Devour Engine. Devour is proving a real hit with my Learners. Unit completion rates are measurably higher now and support calls have dropped to almost zero. Devour is going to transform our business! No Chef reveals all his secrets! This feature is very special in competency-based e-Portfolios. Our Devour Engine logs everything. No cached data for us – a page refresh will provide the very latest KPI data. Support for a product should be ‘given’ and with Devour, it is all part of the low-cost of partnering with us. Embracing the future, we’ve added an ‘on-canvas’ knowledge base system that is always available and is constantly updated. We’ll not leave you feeling unsatisfied or unloved, we’re here to help you succeed with your learning and your business. For me, the “Find a Learner” panel is superb. I can do 90% of the daily common tasks with all my learners (and those of my colleagues if they are out that day) in just a few clicks. So much faster and functional than what we were using! 256 bit SSL connections running through our PCI compliant servers which in turn sit behind enterprise-grade firewalling coupled with our granular permissions, we’ll stop all sorts of automated and human generated nasties by default. (Oh, and we hash all passwords as well. So, if you forget it, you’ll have to reset it!). Our best-of-breed backend architecture is based on 20 years experience with databases and server tech. With our clustered servers and options of hot/cold storage, we can chomp through your requirements whether it’s one or 100,000 users. We’re greedy for speed and our Devour Engine is on a permanent code-diet. We measure queries in milliseconds not seconds, our proprietary code is crafted with the latest responsive and browser standards in mind. We’ll help mitigate some of your data-compliance responsibilities with our inclusive six-year data retention policy. Compared to other e-Portfolios, that will save you up to £12,000. You’re very welcome. The Devour Engine allows you the freedom to customise the look to your own corporate desires. With access to over 830 Google fonts and an ever increasing range of colours and modules to modify, you can get your e-Portfolio looking just how you want it. We love learning and improving our beloved Devour Engine. We code fast and have been iterating almost daily. In our free-forever version, you receive everything that the Enterprise enjoys with a couple of caveats. Send me more on the Free version!